One of Houston’s premier business and retail centers, the Galleria features luxury condos, upscale fashion boutiques, and world-class dining. Located west of Loop 610, the Galleria is one of Houston’s main business and retail centers. Vibrant and eclectic, the neighborhood is a bustling mix of offices, posh boutiques, restaurants, and upscale homes. CENTRAL LOCATION: As one of Houston’s key districts, the Galleria has shopping centers, hotels, schools, and offices within a stone’s throw of its homes. LUXURY HIGH-RISES: Galleria is home to posh residential condo buildings like The Montebello, Cosmopolitan, Astoria and Villa d’Este. These high-rises have 24-hour staff, guards, secure parking, gated entrance, building security, tennis courts, pools, saunas, fitness rooms, well-kept grounds, roof top decks, and more. Porters, valet, building managers, concierges, trash, and dry cleaning pickup services are also available in some luxury buildings. WORLD-CLASS SHOPPING, DINING, AND ENTERTAINMENT: As Houston’s premier shopping destination, the Galleria/Uptown area is filled with fashion boutiques and various retail hotspots. Galleria homes are within minutes of over 425 dining and entertainment establishments. MAJOR JOB CENTER: The Galleria features more than 23 million square feet of office space and is one of Houston’s main business centers along with Downtown. Living in the area offers a great commute to anyone working nearby. STEADY REAL ESTATE MARKET GROWTH: Galleria real estate is among the best in Houston based on Land Value Appreciation. The district showcases a variety of options: chic condos in high-rise buildings, townhomes in gated communities, patio homes, and new construction custom-built homes. EASY ACCESSIBILITY: The Galleria is located along two major freeways, including Loop 610 and the Southwest Freeway. Major Houston thoroughfares line the district and provide additional access to other key Inner Loop hubs. The Galleria real estate market is tricky to navigate due to some homes’ proximity to freeways (which can be bad for resale values), lack of zoning (some homes are close to bars and restaurants, which can lead to noise and street parking issues), and uneven development. Some neighborhoods and complexes sell at a premium, while homes in other areas can sell at a discount. Some condos may have poor resale values (due to HOA, poor construction, and general design problems). 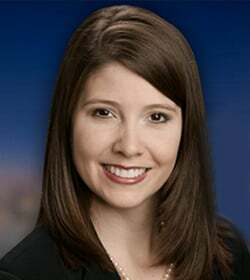 For help in navigating this complex market, contact Paige Martin, one of Houston’s Best Realtors and one of Galleria’s most active real estate agents. Enter your email to get this free Galleria guide in easy-to-read PDF format. Bonus: Also see how this area compares with nearby top neighborhoods. I am interested in Galleria and would like to get more details. Located some 5 miles west of downtown Houston, the Galleria is one of the Bayou City’s key business and retail districts. As one of Houston’s key districts, the Galleria has shopping centers, hotels, schools, and offices within a stone’s throw of its homes. Galleria is home to posh residential condo buildings like The Montebello, Cosmopolitan, Astoria and Villa d’Este. These high-rises have 24-hour staff, guards, secure parking, gated entrance, building security, tennis courts, pools, saunas, fitness rooms, well-kept grounds, roof top decks, and more. Porters, valet, building managers, concierges, trash, and dry cleaning pickup services are also available in some luxury buildings. The Galleria is located along two major freeways, including Loop 610 and the Southwest Freeway. Major Houston thoroughfares line the district and provide additional access to other key Inner Loop hubs. As Houston’s premiere shopping destination, the Galleria/Uptown area is just teeming with fashion boutiques and various retail hotspots. Galleria homes are within minutes of several dining and entertainment establishments as well. The Galleria features more than 23,000,000 square feet of office space and is one of Houston’s main business centers along with Downtown. Galleria real estate is made up of a wide variety of housing options, ranging from chic condos in high-rise buildings, townhomes in gated communities, patio homes, and new construction custom-built homes. 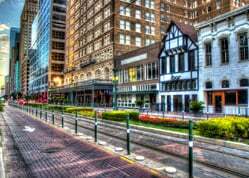 The Galleria area, also known as the Uptown District or simply Uptown Houston, is made up of several neighborhoods and subdivisions. Some communities in the Galleria area are deed-restricted. 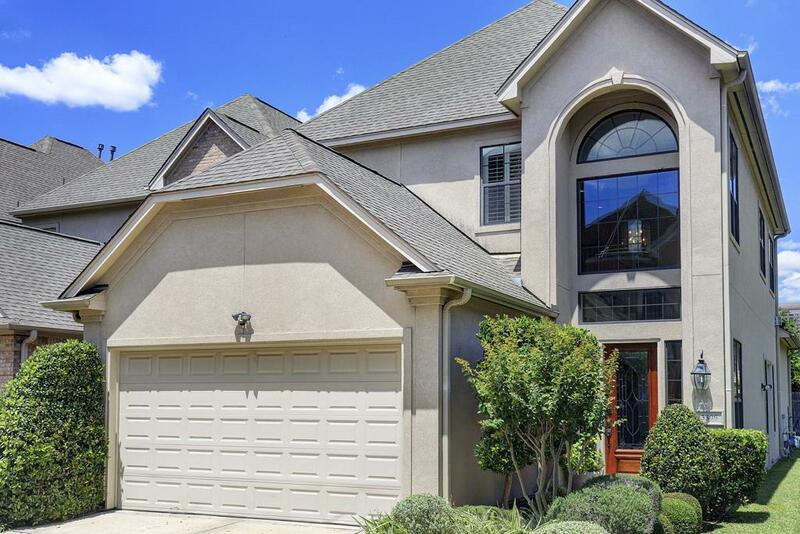 Galleria homes typically feature mid- to large-sized lots (by Houston standards). Lot sizes range from 1,000 to more than 15,000 square feet. Home sizes and floor plans vary. Three- to four-bedroom floor plans are common, spread across 1,000 to more than 8,000 square feet of living space. 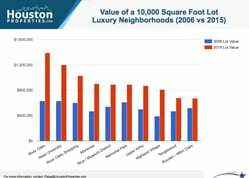 Homes in the area typically sit on large lots (by Houston standards). Lot sizes can range between 7,000 to more than 10,000 square feet. New construction Galleria townhomes and patio homes are typically located within gated communities. 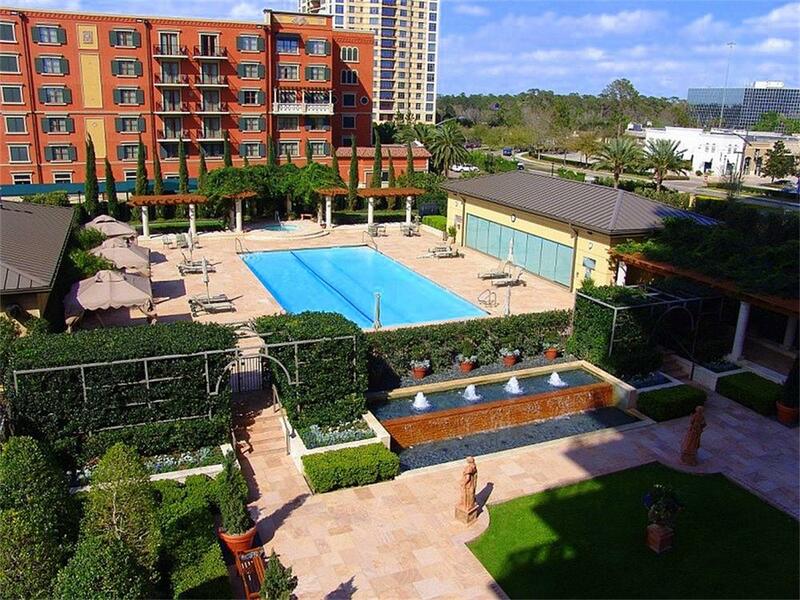 Amenities usually include 24/7 security, controlled access, and landscaping services. Prices for Galleria homes for sale can start at around $200,000 and can go up to more than $2,000,000. Located about 5 miles west of downtown Houston, the Galleria is nestled along two major freeways, Loop 610 and Highway 59 (Southwest Freeway). 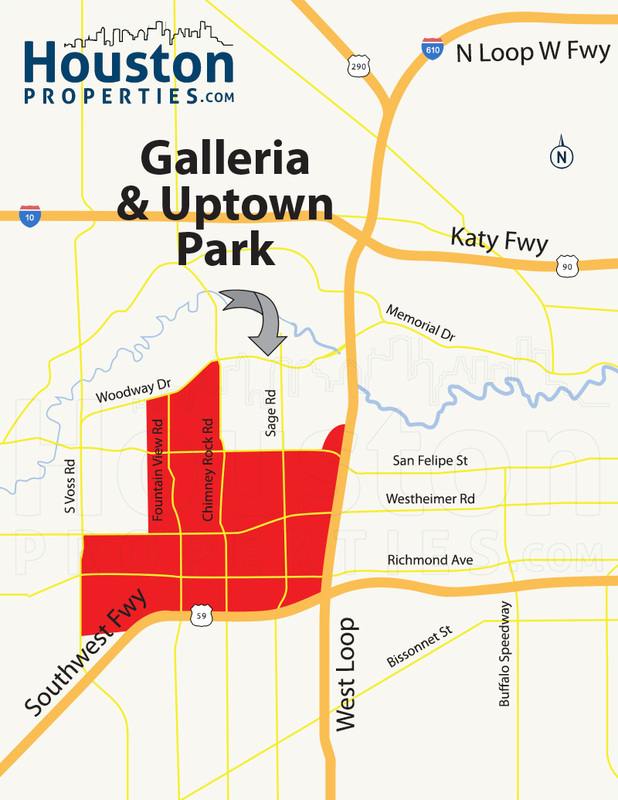 Also known as the Uptown District or Uptown Houston, the Galleria area is located south of the Memorial area and the Memorial Villages, west of Memorial Park and Afton Oaks, east of Briarmeadow, and north of Bellaire. As a satellite central business district, the Galleria enjoys having a multitude of schools, boutiques, job centers, hotels, and restaurants within its borders. Luxury highrise condos, single-family homes, and townhomes are mixed in with the district’s plethora of retail, business, and entertainment centers. The Galleria, the upscale mixed use development, is a retail complex with 2.4 million square feet of leasable space. More than 300 stores make up the complex. Galleria homes have easy access to major roads and freeways, including San Felipe Street, Westheimer Road, Richmond Avenue, and Woodway Drive, among others. Several Metro bus routes cover the Galleria/Uptown area, along with a bus rapid transit line. Galleria homes are zoned to the Houston Independent School District (HISD). Established in the 1920s, Houston ISD is the largest school district in the state (with 283 schools). The Texas Education Agency (TEA) gave the district a “Met Standard” rating in 2016. HISD features several International Baccalaureate (IB) World schools, including Briargrove Elementary and Lamar High School. Briarmeadow Charter School at 3601 Dunvale Rd. Students within the Galleria can choose instead to apply to Briarmeadow, a charter school serving grades Pre-K through 8. The school offers Pre-AP Placement and Gifted programs. Lamar High School at 3325 Westheimer Rd. As one of the Houston ISD’s International Baccalaureate schools, Lamar has one of the largest IB programs in North America. It also offers a business administration magnet program, a neighborhood program, and an Advanced Placement program. The school also offers a great athletics program, with its football team (LamarTexans, formerly Redskins) reaching the playoffs 30 times. Westside High School at 14201 Briar Forest Dr. As the Houston ISD’s Magnet School for Integrated Technology, Westside’s curriculum centers on 5 aspects: Media Relations, Applied Science/Health Science, Fine Arts, Business, and Computing Sciences. The following are some of the more notable private schools near Galleria. Saint Agnes Academy at 9000 Bellaire Blvd. Al-Hadi School of Accelerative Learning at S Voss Rd. The Awty International School at 7455 Awty School Ln. 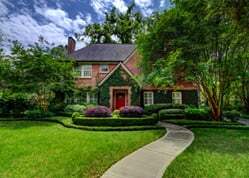 To find an updated listing of all Galleria real estate zoned to any specific public school, please send an email to Paige Martin at Paige@HoustonProperties.com with the property preference and budget that you’re working with. 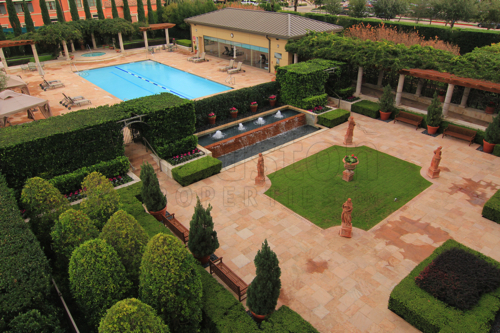 Galleria real estate is among the best in Houston in terms of land value appreciation. Several factors affect Galleria’s relatively healthy property values, including new development in the district, its central location, and high accessibility. With its great assortment of homes, there’s something for everyone in the Galleria. 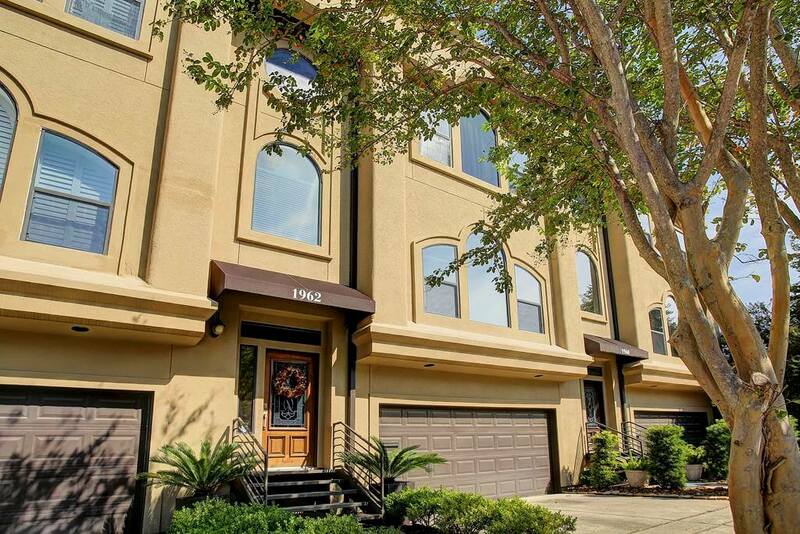 Single-family homes, townhomes, and condos in various designs, sizes, and condition are available in the district, though as with most Houston neighborhoods, the Galleria real estate market can be tricky to navigate. This is due to the number of neighborhoods that make up the district. Since trends are local, homebuyers will need to look into the specific neighborhoods for a more accurate view of Galleria real estate. 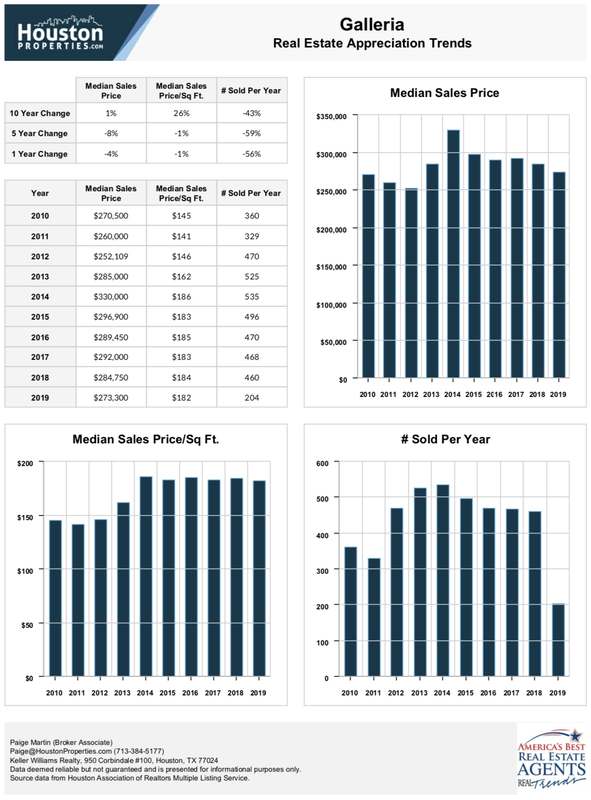 For updated information regarding Galleria real estate pricing and trend analysis, please contact Paige Martin at Paige@HoustonProperties.com. Even with the district’s rich pool of high rise condos, Galleria single-family homes are still a popular choice among homebuyers. Ranging from vintage patio homes to new construction custom-built luxury homes, the area offers several options that would suit one’s wants and needs. Architectural styles vary, with homes ranging from traditional, contemporary, ranch, Mediterranean, and French, among others style sensibilities. Galleria homes for sale typically offer 3- to 4-bedroom floor plans, with living spaces ranging from 1,000 to more than 4,000 square feet. Homes in the area sit on mid- to large-sized lots (by Houston standards), with sizes from 3,000 to more than 15,000 square feet. The most expensive Galleria real estate can feature 5 to 6 bedrooms spread across 4,000 to more than 8,000 square feet of living space. Landscaped and wooded grounds, swimming pools, multi-car garages, and other luxury features are common in these homes. Some subdivisions and communities within the Galleria area have deed restrictions in place. A number of factors play a role in pricing, including location, size of the home, and condition. Prices for Galleria homes for sale can start at $350,000 to more than $2,000,000. Townhomes are fairly popular in the posh Galleria-Uptown area. Demand for housing within the district has led to several new construction Galleria townhomes, some of which are located within gated communities. Community amenities vary, but controlled access, round-the-clock security, and central park areas are common. Compared to their single-family home counterparts, Galleria townhomes and patio homes typically offer smaller lot sizes, from 1,000 to about 6,000 square feet. Two- to three-bedroom home options are common, though bigger properties can feature as many as 4 to 5 bedrooms. Living spaces range from 1,000 to more than 4,000 square feet. Galleria townhomes can start at around $200,000, with some of the bigger and newer properties selling for $900,000. With entertainment, retail, and job centers all within a stone’s throw away, Galleria Houston condos are a popular option. Apart from convenience and accessibility, Galleria highrises offer luxury amenities like 24/7 staff and security, parking, tennis courts, fitness centers, pools, private gardens, and rooftop decks, among other things. New residential building development has brought three new construction Galleria condos, including the Astoria, the Aurora, and the Belfiore. Condos in the Galleria are also a short distance to the district’s many office buildings. See all of Galleria Condos on the map below. 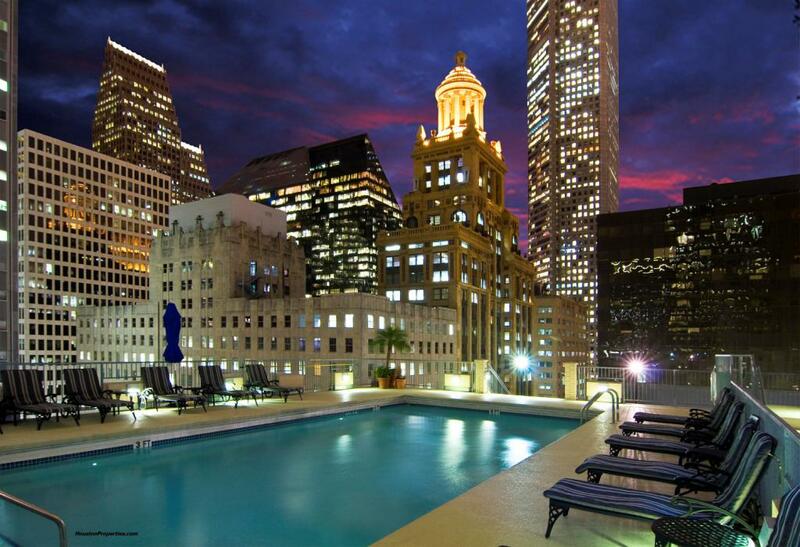 Cosmopolitan – Known as “The Triumph Tower of Houston”, Cosmopolitan is a 22-story highrise popular for its world-class condo features and five star hotel-like amenities. Astoria – Astoria lies in the heart of Galleria. The 28-story high building features Modern Art Deco architecture and Galleria and Downtown views. Highland Tower – Designed and completed in 2010 by Ziegler Cooper Architects, Highland Tower features a wide floor plan selection and “modern-meets-classic” architectural design. 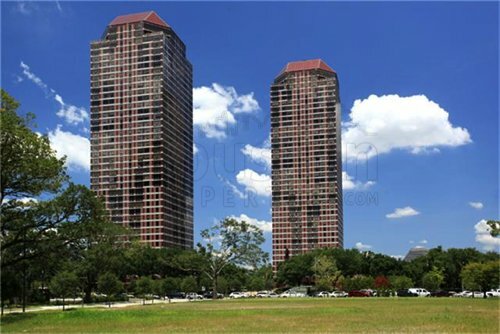 Montebello – One of the districts most popular condo buildings, The Montebello is a 30-story high residential building towering over Uptown Park, just north of Houston’s vibrant Galleria. Villa D’Este – Villa D’Este (built in 1999) is a sister property to The Montebello (built 2003). It is only a few hundred feet from Uptown Park, and is known for having high security and top-notch service. Four Leaf Towers – A Cesar Pelli creation, Four Leaf Towers is a towering pair of residential high-rises. 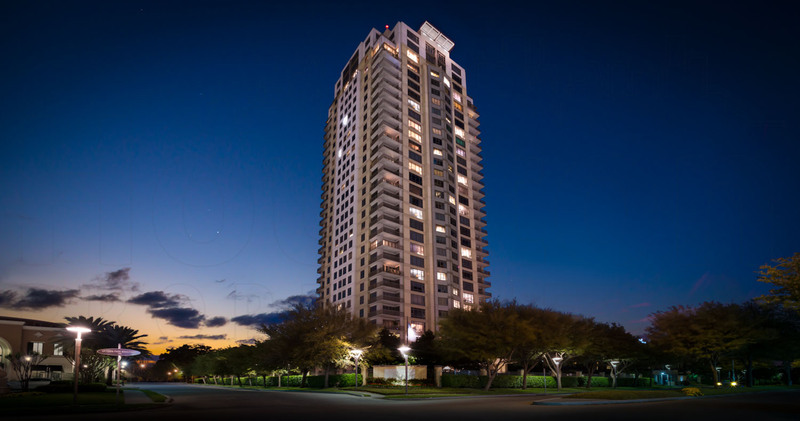 The 40-story high condominium was one of the first luxury condo buildings in the Galleria. The Bristol – Located at the epicenter of Houston’s finest dining and shopping establishments, The Bristol is also within blocks of major freeways, Downtown, Greenway Plaza, Medical Center, Reliant Park and Museum District. Empire Lofts – Boasting of Classic New York architecture, Empire Lofts is also a few blocks from Uptown Park landmarks Williams Tower, Waterwall, The Lakes on Post Oak and Galleria IV. Lofts On Post Oak – A premier Uptown loft development, Lofts On Post Oak also has an impressive list of urban amenities including valet, concierge, room service, 6 resort pools, 20-seat theater, and more. Manhattan – Popular for its French Beaux-Arts style architecture, Manhattan’s heavy stone base, two-story and paired columns, arched windows and grand arched openings are reminiscent of historic buildings in New York. St. James – Towering over the Uptown and Galleria area, St James is a 24-story building with a 25-year reputation as one of the earliest residential highrises in Houston. The Mark – The Mark is a 30 story residential highrise that features intercontinental style through its European-inspired architecture. The Mercer – The Mercer is a 30-story residential highrise known for its state-of-the art amenities. The Mercer only has one to two units per floor, providing its residents ultimate privacy. The Oxford – Directly adjacent to the Galleria complex, The Oxford is a 21-story highrise with 20-year reputation as one of the premier residential condo buildings in Uptown Houston. Venti – Venti is a European architecture-inspired building with twenty exclusive units. The residential midrise features private, luxurious, and modern condos for sale. The beginnings of the Galleria can be traced back to the 1940s when prominent Texas oil tycoon Glenn H. McCarthy had an idea – to build a sprawling shopping and hotel complex in the Houston area. As with most grand ideas however, McCarthy’s plans took a while to materialize. In the 1960s, long after McCarthy had scrapped the concept, real estate magnate Gerald D. Hines took over the development of what is now known as the Galleria. First opening its doors on November 1970, the Galleria got its name from the building that inspired its architectural design and aesthetics – Milan’s Galleria Vittorio Emanuele II. During its early years, the Galleria only featured 600,000 square feet of retail space. Additional expansions and developments in the subsequent years led to making the Galleria what it is today. With over 2 million square feet of retail area and approximately 375 stores and services, it is the biggest shopping mall in Texas and the eighth largest in the United States. The development of the Galleria in the late 1960s also sparked the development of Houston’s Uptown District. Gerald D. Hines and other real estate investors saw Uptown’s potential and implemented various developments in the area. As with the Galleria, the Uptown District underwent a transformation from being an underdeveloped area to one the most vibrant and bustling hubs in Houston, boasting to having more hotel rooms, office spaces, and retail shopping centers than the Downtown Houston. Surrounding communities and neighborhoods thrived alongside the commercial developments in the area. 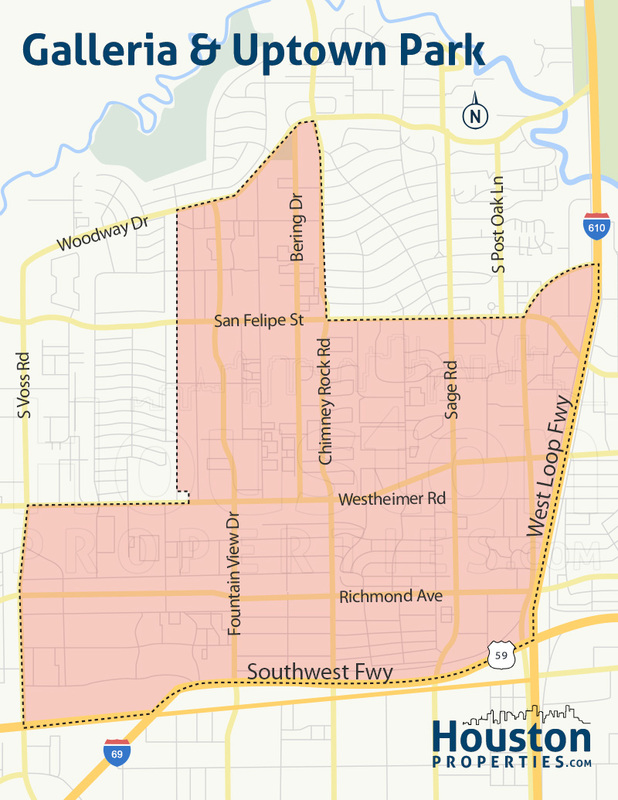 Today, the “Galleria area” refers to the several upscale neighborhoods and communities south of Woodway Drive, east of Loop 610, north of Southwest Freeway, and west of S Voss Road. As Houston’s main destination for retail, there is no shortage of fun things to do within the Galleria/Uptown district. There’s the Galleria itself. It is the largest mall in Texas, with over 375 stores. With 2.4 million square feet of total retail area, its sheer size is rivaled only by 7 other retail centers in the United States. Its current anchor stores include Neiman Marcus, Saks Fifth Avenue, Macy’s, and Nordstrom. The Galleria also features over 50 restaurants, a jogging track on the roof, a skating rink, and various other entertainment and dining options. Located just north of the Galleria is Uptown Park, an open European-style shopping center. It offers a pedestrian-friendly vibe, and features several upscale retail, service, and entertainment centers. Must-visit stores in Uptown Park include Facade, Longoria Collection, Mint Kids & Baby, M Penner, and Elizabeth Anthony Esther, among others. Should residents find those two retail centers lacking, there are plenty of other options within minutes of the Galleria, including Rice Village and Highland Village.